It is my opinion that you just can't go wrong when gifting chocolate. It's my go to gift when I'm in a pinch for a last minute hostess gift. It's also a much loved gift when I am the recipient. For business owners See's Custom Logo Boxes are a great way to express your appreciation, help introduce a new product or service, build brand loyalty, and so much more. 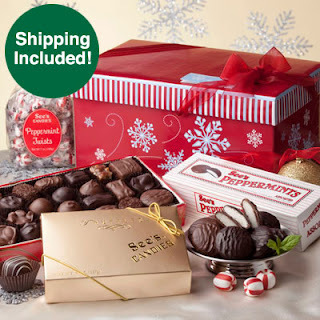 See's has an assortment of chocolate gifts perfect for every gift giving occasion. With over 200 stores located in the West, See's has a reputation for friendly old fashioned service. Now just in time to spread holiday cheer, for those of us who prefer online shopping, See's offers free shipping on select gift packs.